Securely store your online passwords and log in to your favorite sites with just one click using AOL OnePoint. We’re sorry, AOL OnePoint is not currently available for Mac users. Please return to this page on a PC to download AOL OnePoint for your desktop or click on the "Mobile Version" tab above to use it with your iOS or Android device. To view other products included in your plan, please visit mybenefits.aol.com today. Access all your online accounts from an easy-to-use dashboard. AOL OnePoint provides multiple layers of security and encrypts all your usernames, passwords and payment details, to help protect you from identity theft and keep your information safe. This mobile security benefit is part of your AOL membership – at no additional cost! Unlock your online accounts with a customized pin, so you don’t have to remember multiple passwords and usernames. Manage your credit card and billing information for quick checkout when online shopping. Securely log in to any of your online accounts from up to five devices. Get alerted if you’re about to visit a malicious site. 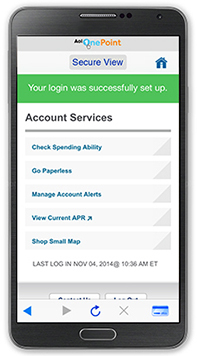 Securely login to any of your online accounts from one app on your tablet or mobile device. PIN number authentication accesses all your online accounts, so you don’t have to remember multiple usernames and passwords. Get alerted if you’re about to enter a malicious website, to help protect you from online threats and identity theft. Stop scrambling for passwords and login credentials. One click grants access to the websites and accounts you visit. Your sensitive data, including payment information and personal addresses, are encrypted using multiple layers of security. Enjoy peace of mind knowing your data is safe. Be sure to take advantage of all the valuable benefits that are included in your AOL membership -- at no additional cost to you. 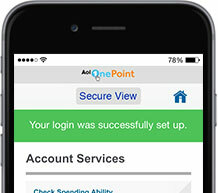 Open your One Point mobile app to access any of your accounts right away. Use your AOL OnePoint mobile on up to five tablets or mobile devices, so you can protect the whole family. For PC users: Windows 8, Windows 7, Windows Vista (32 or 64-bit version), Windows XP with Service Pack 2 (32-bit only) or higher. If you are running Windows XP and haven’t upgraded to Microsoft .NET 3.0, the AOL OnePoint setup process will install it for you. This may take a few extra minutes depending on your internet connection. iOS users: iOS 7 or later. Compatible with iPhone, iPad and iPod Touch. Android users: Smartphones or tablets running Android 2.2 or later.